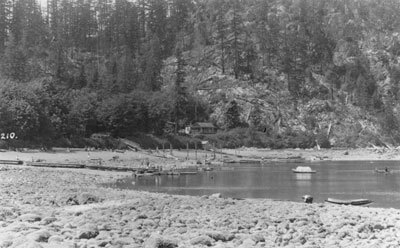 View of Horseshoe Bay beach at low tide. Numerous small docks can be seen with rowboats tied to them. Scanned August 2011 using Epson Perfection V700 Photo at 300dpi and 100% of original image size. Alternate Versions: Lossless TIF from original scan at 300dpi and 100% of original print. W24 x H13 cm black & white print on photo paper.